Swatch turned 30 this year, but its story could have been entirely different if the Swiss watchmaking industry had continued on its downward trajectory of the 70s. A look at how brand embraced disruptive technologies through marketing idea and reversed the fortunes of a floundering industry. In popular culture, Switzerland is synonymous with clockmaking and watchmaking. The tradition of Swiss clockmaking craft dates back to the 16th century, and while the second world war saw watchmakers in other countries limiting production and supporting the war effort, Swiss neutrality gave the industry an unexpected push. However, in 1983, centuries of history nearly came to a bitter end as the number of watchmakers shrunk to a quarter of the industry’s size in 1970. The legendary Swiss watch industry was on the brink of being erased. No industry is safe from disruption and the Swiss watchmaking industry was late to adopt the disruptive technology of that time – quartz movement. Conductive quartz crystals use electronic means for accurate measurement of time, with significantly less moving parts than mechanical watches. The development process presented many new challenges, but the potential was clear: slimmer, more affordable watches. In the 50s and 60s a consortium of top Swiss firms competed with Japanese Seiko to come up with the first quartz watch. One of Seiko’s earliest models was used in the marathon of the 1964 Tokyo Olympics. A couple of years later both Seiko and Swiss Longines presented quartz pocket watches at a similar time. Competition seemed close in the 60s. For America and Japan, the following two decades became known as The Quartz Revolution. And yet to this day the Swiss still call that period The Quartz Crisis. The Swiss were hesitant to trade their tradition of mechanical watchmaking for this new electronic technology. They had a traditional, organised, close knit industry with a strong sense of identity. They knew what watchmaking was about – it wasn’t electronics. Throughout the 70s, other manufacturers pushing forward the cost effective and accurate new technology slowly took over, producing slimmer, lighter, attractively priced watches. And this was even before the world fell in love with LCD digital watches from companies like Casio. By 1978 the world had moved to quartz movement and the Swiss watchmaking industry was in trouble. Global market share fell from a comfortable 50 per cent to a worrying 15 per cent. The future looked grim. For too long they focused on building better horse-drawn carriages in a world of cars. Salvation came unexpectedly, and at the darkest hour. In 1983, the industry merged the two leading watch groups into a new group called SMH. This was partly an outcome of a consolidating and shrinking industry, and partly a last ditch attempt at saving the industry. Bankers stepped in and took control of the dying business and nominated an unlikely industry outsider, Lebanese-born entrepreneur Nocials G. Hayek who knew little about watchmaking and originally headed an engineering consulting firm out of Zurich. Hayek empowered the newly appointed head of the watch division to come up with something new. This was Ernst Thomke, another outsider and a man with an eclectic background. Thomke created what we can see as ‘an implicit brief’ with principles that went against almost every traditional inclination. The new watch must have a contemporary, fashionable style. It must be cheap to make, priced at the low-end rather than compete in the range between premium and luxury that Swiss watches more comfortably occupied. He set out with a focused team of engineers to come up with a new concept. If this happened today he’d be swarmed by brand managers crying about throwing away brand equity and pouring out the baby with the bath water. 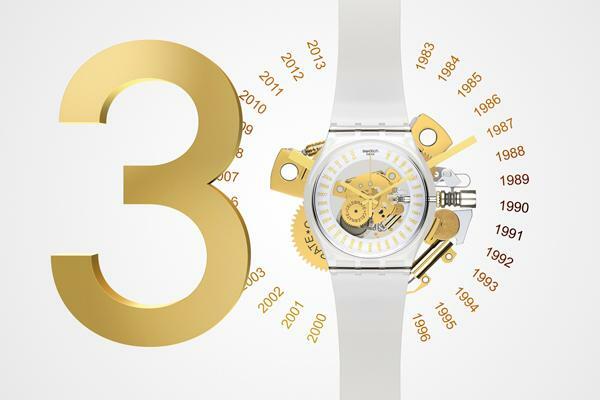 They had every reason to doubt this concept and yet, in March 1983, the Swatch was born. Traditional Swiss watchmaking was about history, craft and strong links to luxury. Japanese and American brands were about technology, both as a vehicle for innovation as well as democratisation. The Swatch took a different approach. On the one hand, it embraced the disruptive quartz technology and evolved it: it contained and continued to add technological innovations. On the other hand, it packaged technology under an analog face and used that face as an artist’s canvas – a playground for contemporary design and fashion. The name was coined to stand for ‘second watch’. The idea was to make a watch so affordable and stylish that people would own more than one. Swatch quickly became a huge success for SMH. So huge that over the next couple of years it won back much of the dominance lost to the Japanese and saved the entire industry. Over the next decades it quickly became the dominant lower-end brand, releasing hundreds of designs with collectible and fashion appeal. It’s not just poetic justice that SMH changed its name to the Swatch Group in 1998. And here comes an extra twist in the plot. Not only did the introduction of Swatch resuscitate the Swiss watchmaking industry, it also gave mechanical watches a new lease of life. Swatch took over a global mass-market audience and mechanical watches used its success to reinvent themselves as luxury status symbol celebrating craft and tradition. The luxury wristwatch is the opposite of Swatch frivolity. It’s a wrist-based monument for human achievement. And to further reaffirm that status, they religiously refer to themselves as ‘timepieces’. One major player in that category, Omega, is still owned by Swatch. History is written by the winners, so we tend to celebrate the disruptors rather than mourn the disrupted. But the story of Swatch doesn’t fall into this pattern. First, because it’s one of those rare stories of an industry facing disruption and yet prevailing. But more interestingly, because its solution mixes the embracing of a new business paradigm, like quartz and affordability, with taking that paradigm to new places – creating a new ‘fast fashion’ market for watches. Nowadays, many sectors are facing disruption. For many industries the internet served as a massive disruption engine. High street travel agents, traditional airlines, newspapers, paper, landline phones, high street retail, post, fashion, traditional advertising, TV, logistics… The list goes on. Even businesses which are digital at their core aren’t safe – progress is so rapid that disruptive technologies come in quick succession. Think how quickly Google demolished the paradigm of the generation of search engines which preceded it. It’s better to be the disruptor than being disrupted, and there aren’t many choices left in the middle any more. But if you are in an industry going through cataclysmic change – and it’s likely you are – ask yourself: how creative and bold is your thinking? How can you embrace the new paradigm? Can you make a genuine new contribution to it? And as uncomfortable as it may be to break out of your own paradigm, look for inspiration outside your industry and mix strong outsiders with real power to influence with your existing experts. Hopefully, you won’t need to face extinction before you start seriously exploring new ideas. And remember, exploring ideas is one thing, but being bold enough to act on them and trust your future to them is the hard part.